Erika Harold speaking to supporters. 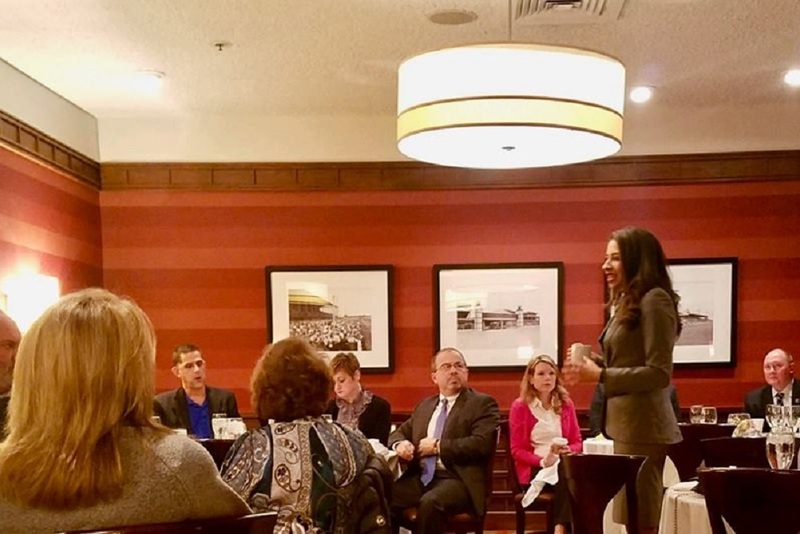 Erika Harold believes all her priorities are in order to effectively represent the state of Illinois as its next attorney general. Soon after launching her campaign, she told the Prairie State Wire she would focus on putting the voters of the state first, no matter what. “My campaign’s emphasis on combating public corruption, fighting for the people’s interests as opposed to political interests, and upholding the rule of law will remain the same,” she said. Indeed, ethics has become a hot-button issue in the March 20 election given Harold’s Republican primary opponent Gary Grasso has a checkered past that the Prairie State Wire has previously reported includes suspect campaign contributions he took from foreign governments and potential ties to reputed members of the mob. Through it all, Harold a former Miss America winner and Harvard Law School grad, has continued to impress. She also previously ran against Rep. Rodney Davis (R-Taylorville) in the 13th Congressional District. Against Grasso, Harold has bagged the endorsements of at least 12 senators and 32 House representatives, among them Rep. Jeanne Ives (R-Wheaton), who is challenging Gov. Bruce Rauner in the Republican primary. Ives has also saluted the 38-year-old Harold as part of the face of the future of Springfield, someone who she believes brings “impeccable credentials” to the table. Now an attorney with the Champaign-based law firm of Meyer Capel, Harold’s campaign has been all about building a grassroots movement people can rally behind. The 16,000 signatures she gathered to secure her spot on the ballot were more than three times the 5,000 needed to get the job done. Harold was named Miss America in 2003 and used the scholarship money as part of her winnings to attend Harvard. She also was named one of Fight Crime, Invest in Kids’ “Champions for Children,” and received a leadership award from the National Center for Victims of Crime. Rep. Scott Drury (D-Homewood) and Sen. Kwame Raoul (D-Chicago) are also running for attorney general. Next time we write about Illinois Attorney General, we'll email you a link to the story. You may edit your settings or unsubscribe at any time.